MMPA: Fast forward to now. What’s the 30-second evolution of your career path? Johnstone: I understood the power of stories even as a kid. I believed when you had a good story you could make people believe stuff. You could influence people. I watched my mom do it with the Eden Prairie News. The power of narrative. Plus, I’ve always been a reader. That’s why I ended up in publishing. Today in the editorial world, you need to be an editor, artist, storyteller and movie star (maybe just a little). But in the end, it’s just story. There are new disciplines but they’re just extensions. MMPA: Did you always want to do this? Johnstone: I thought I might be a doctor, until I ran into organic chemistry. After college, I went to work for my dad’s woodworking business, then I started my own. And I worked all the time. It was hard to be a good dad, and hard to make my small biz work at that time in the ’80s. Following an interesting contract as a technical editor for Cy Decosse, I decided it would be fun to find out what magazine publishing was like. I found a good opportunity to write about what I know – woodworking. Also, I found some bad info out there, and I’m one of those guys who likes to explain the world to people. I don’t know if there’s anything else I could have been writing about. I’ve done everything from framing houses to building guitars. I think I have a scope of experience and knowledge that I can share. And I’ve always like telling stories. MMPA: Creating stories for a magazine is one thing, but what about content marketing for Rockler Companies, Inc.(35+ retail woodworking and hardware stores)? Johnstone: People get nervous around this – are we journalists or marketers? I think we can be both. As long as there is value in content we’re delivering. Johnstone: To be successful, consumers must value the content. Whether they purchase from a company or not – that’s irrelevant. The narrative is key; there must be quality story building and the right delivery. MMPA: The Eden Prairie News bit, is that for real? Johnstone: Yes, my mom, with her college education, took a mail order course to become a graphic artist. I remember her doing this ‘homework’ when I was a school kid. Then she got a job with the Sun Newspapers. It was just The Sun then, and eventually she decided she wanted to make her own newspaper. She bought an IBM Selectric typewriter – seriously, we used one. And she started writing stories. The newspaper celebrated an anniversary recently, and they had my mom in for a photo shoot and story. MMPA: What’s Rockler’s history with content marketing? Johnstone: Today’s Woodworker was a magazine Rockler created to support its products. After a year or two, it became clear that the P&L wasn’t working out – there was no advertising. Then the Woodworker’s Journal magazine came up for sale. I always said we should be like the Dutch Uncle – like the guy giving advice over the fence rail in a firm but neighborly style. If we tell stories from a base of expertise, and if we’re willing to share without expectation, we could be that Dutch Uncle that everyone respects and trusts. MMPA: There is a trend toward content marketing that shares opinions and political views. Is that Rockler? Johnstone: No, definitely not. They will plant trees on Earth Day and make it all about wood. Or maybe do special content for Veteran’s Day that can be turned into a fund-raiser specifically for veterans. They keep their enthusiasm focused on woodworking. That’s their DNA. This is something I need to stay aware of. I love the political content, personally, but my readership doesn’t want to interface with political discussions. I did that once. 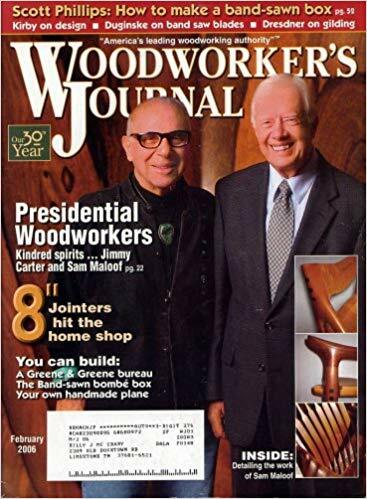 Sam Maloof was a famous woodworker, and he’d built furniture for Jimmy Carter. I had the chance to get the two of them on the cover of Woodworker’s Journal. I was very excited, it was a great story, but I got such blowback. My readership did not care for it. I tried to introduce something they did not want to see in the magazine. MMPA: What are you reading? The whole idea of narratives that people form. I was reading a piece in the Washington Post about evangelicals and support of President Trump, and the writer just let the people speak. He presented these narratives in an honest and compelling style. When I read something like that, I consider it to be important journalism, maybe even a little more so than how to turn a wooden bowl.